Every now and then, I feel there is too much technology in our lives. Oh, do not get me wrong, I enjoy checking the weather on my smart phone and using Google to research the things that flit across my mind. Nevertheless, sometimes that same technology is overwhelming. For instance, this weekend I received an automated call from the village hall of my town. I was not home when the call came in, thus a message was left via voice mail. When I returned home, I checked my Caller ID and noticed that the village had called. My problem…I do not know how to access my voice mail on the house phone. My cell phone dials voice mail automatically, but the landline requires that I dial a number and put in a password. I use to know the number and the password, however, the phone company I use, just upgraded their system. I should know this information, except that my husband set up the new voice mail. I wrote down the number and password somewhere. I do not remember where I put the numbers, and my husband is out-of-town camping. I would have called him on his smart phone, but apparently, his phone has gone deaf, blind and dumb. He is not available to take my call or my text. Therefore, I do the next best thing, and Google my phone service provider. At their website, I am asked for my user name and password. I do not remember this either. I try every combination that I know without any luck. Finally, I look up voice mail in the help section of the web site. I am able to surmise that if I press *98 I can call my voice mail. I call and I am asked for yet another password. I am okay with this request, because I know my husband made it the same number we have used since phone companies have begun asking for passwords. I confidently typed in the number and I am told that the number is not valid. I type it in again, thinking that maybe I pressed a wrong digit. I receive the same message. Rats! All I want to know is what the village is calling my house to warn me about on a Friday night! I worry that maybe we are under some sort of boil water order or maybe there is a killer roaming the streets. I need to know if I should barricade the house. I think about calling my neighbor to ask if she received a call from the village, but it is getting late. I am still thinking about that call when I go to bed. I cannot sleep, so I go out to the computer and check the village’s website to see if there is some sort of word of caution. Nothing. I open the back door and listen. Nothing. The only thing I do notice is that it smells like a swamp outside. So much for technology helping me in this situation. The village could be calling me to tell me the world is ending. I would not know, because I do not have a flipping password. The next day, my neighbor is sitting out on her porch. I wave and ask her if she received a call from the village. She informs me that she did and that the village was calling to inform its citizens that they would be spraying for West Nile Virus. Hmmm, that explains the swamp smell and the phone call. Whew, nothing horrible except that poison is being sprayed in my town to help alleviate the mosquitoes carrying a deadly virus! As soon as my husband comes home from camping, the first thing I am going to do is have him write down all the passwords to everything we own in a notebook. I will keep that notebook in a safe place for the next time technology wants to send me an important message. Nothing like being prepared. Posted in Living the Life and tagged Automated Calls, Grandmother Musings, humor, Passwords, phone service provider, Phones, postaday, technology, User Name, Voice Mail, West Nile Virus. Bookmark the permalink. Great story! 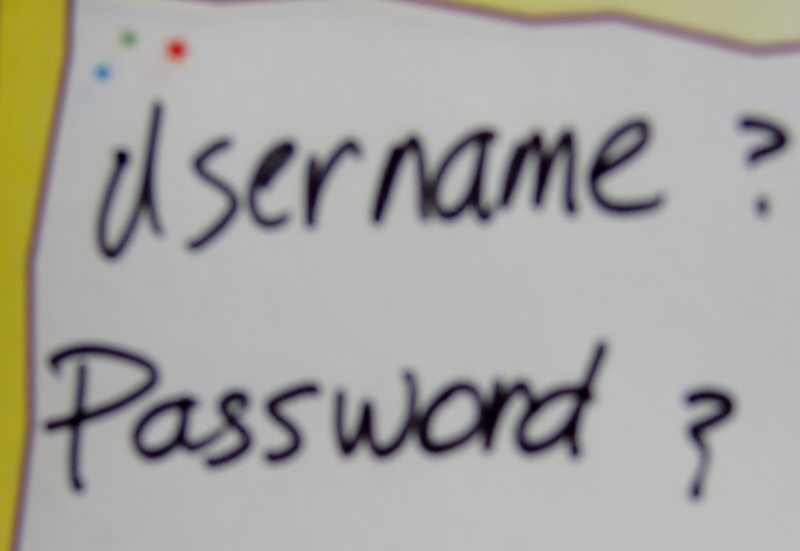 I think passwords are getting out of hand. I have a notebook full. What a mess! It would be much easier to just use one, but they say you shouldn’t do that. I have several pages of passwords scribbled in this one notebook. It does get frustrating! I had to giggle because I’ve had a few situations similar to this happen to me.